You don’t have a meal schedule. This is more important than you think when you are on a diet. Your body needs to adapt to your new eating style, but this will not happen if you are not organized. If you eat your dinner at 6 p.m today, and at 10 p.m tomorrow, there will not be any change in your weight. Most of the people need to eat 3 meals and 2 snacks; it can be more or less depending on your activity level. Either way, make sure that you are having your meals at the same time every single day. It will make a big difference. You are not drinking enough water. When you don’t drink enough water, your body will store the one that you are drinking. Do you know what this means? That you will be bloated, “heavy” and tired all the time. Besides, you will have “water weight”; basically, it’s not fat, it’s just your body retaining water. Drink at least two liters daily to prevent this. You are eating wrong. 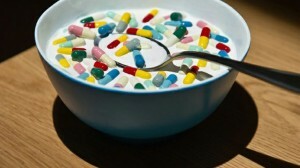 And by this, I don’t mean that you eat bad food; you just mix the aliments in a bad way. Carbohydrates and proteins will never go well together, no matter how much (or not) you eat. Meat with rice or potatoes (even if it’s turkey with brown rice) is very hard to digest, and it will keep you away from your goal weight. You are eating too many fruits. Yes, this is possible! Fruits are indeed very healthy and they are full of vitamins, but some of them are also full of sugar and calories. There is absolutely no problem to eat them in the first part of the day. However, if you replace your dinner with bananas, don’t expect to lose too many kilograms. You don’t sleep enough. You might think that sleep has nothing to do with food. Well, this is wrong. When you are sleep deprived, your metabolism will slow down which means that you will burn calories slower. On the long term, this can be the reason why your diet is not effective. Get 7 hours of sleep every night and things will go better. You don’t eat enough. The same “water” principle applies; if you don’t eat enough, your body will store fat. This is a survival method and the reason why so many women fail to lose weight. If you eat under 1500 calories per day, you will not be healthy, happy or skinny. The secret is in WHAT you eat, and not in HOW MUCH.